The victory might take some of the pressure off Zinedine Zidane. 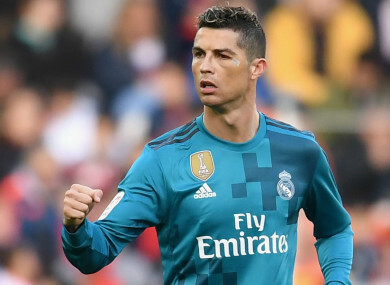 TWO PENALTIES FROM Cristiano Ronaldo helped Real Madrid to a 4-1 win at Valencia on Saturday and eased the pressure on head coach Zinedine Zidane. The 32-year-old scored the 100th and 101st spot-kicks of his senior career to give the champions a first LaLiga win in four trips to Mestalla, with Santi Mina’s second-half header proving to be just a consolation as Marcelo and Toni Kroos struck fine late goals. The scrutiny on Zidane’s position intensified this week when Madrid crashed out of the Copa del Rey with a 2-1 home defeat to Leganes, and he responded by naming a strong side to face Marcelino’s men, which included the return of Ronaldo, Karim Benzema and Gareth Bale to the starting line-up together for the first time since the 3-2 loss to Barcelona last April. Ronaldo was scythed down by Martin Montoya 15 minutes in and promptly dispatched the resulting penalty, and another clumsy challenge from the former Barcelona full-back – this time on Benzema – allowed Ronaldo to double the lead before the break. 👊 This afternoon at Mestalla! Valencia – who remain third in the table after the defeat, two points above Madrid having played a game more – got a goal back through Mina but were unable to find an equaliser despite controlling much of the second half, and Marcelo’s excellent late goal made the points certain before Kroos completed the win with an exquisite fourth. The result moves Zidane’s side four points clear of fifth-place Villarreal and takes them to within 16 of leaders Barcelona, who face Deportivo Alaves on Sunday. Bale missed a good chance after Neto had dropped a cross and Rodrigo Moreno blasted narrowly over the bar during an open first 15 minutes. Madrid’s opener came after a brilliant counter-attack following a Valencia corner, with Ronaldo starting the move in his own half before winning a penalty from Montoya’s clumsy challenge, and he made no mistake from 12 yards. The Portugal star spurned a good chance for a second, scuffing a shot straight at Neto after being picked out by Kroos, and Geoffrey Kondogbia should have equalised when, with the goal at his mercy, he sliced his effort into the ground and safely into the hands of Keylor Navas. The miss was punished seven minutes before half-time when Ronaldo drilled home his second penalty of the match, after Benzema had been barged to ground by Montoya as he tried to jump for Dani Carvajal’s cross. The home fans were beginning to make their frustrations clear and there was a general cry of despair two minutes before the interval, when Rodrigo turned the ball over the bar from six yards out after Mina’s run and shot had left the Madrid defence for dead. Mina had a penalty claim waved away as Valencia sought a lifeline early in the second half, yet they were looking increasingly suspect whenever Madrid went forward on the break and Benzema could have done better than ripple the side-netting after being set up by Kroos. But in the 58th minute, the home side got themselves a foothold in the match, as Mina shrugged off the attentions of Nacho to meet Dani Parejo’s corner and glance the ball past Navas. The visitors suddenly looked jittery at the back and they needed Navas to deny Parejo an equaliser seven minutes later, the Costa Rica international sticking out a leg to save from the Valencia captain after an excellent passing move had split the Madrid defence. Valencia continued to push forward but Marcelo made certain of three important points and a first away league win since October with six minutes left, playing a slick one-two with Marco Asensio before burying a low left-foot shot beneath Neto from the left of the area. There was enough time for Kroos to complete the scoring with the goal of the game, the midfielder completing a flowing team move by placing a low shot past Neto from the edge of the area after being set up by Mateo Kovacic’s backheel. Email “Ronaldo on the double from the penalty spot as Madrid put four goals past Valencia”. Feedback on “Ronaldo on the double from the penalty spot as Madrid put four goals past Valencia”.